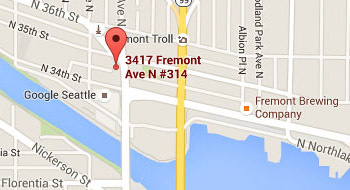 My office is located in Seattle's Fremont neighborhood in the Fremont Building at 3417 Fremont Ave N, Suite 314. Free 1.5 hour parking is available in the PCC parking garage next door. The entrance is off Evanston N. There is free 2-hour parking on N 34th and N 35th streets as well. If you are coming by bus you may use routes 5, 26, 28, 31, 32 or 40 depending on where you are coming from. You may find the Metro Trip Planner helpful in selecting your route. Click on map for directions (by car or bus). To access the Fremont Building use the entrance at 3417 Fremont Ave N, between Sirena Gelato and Fremont Antique Mall; you may come up the stairs and turn right to find the waiting area, or stay left of the stairs to find the elevator located just past the moose statue. Press 2R. 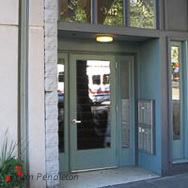 Alternatively you may enter at 3429 Fremont Place N, on the corner between Dream and Portage Bay Goods; come up the stairs and turn left to find the waiting area.